First, you need to have the latest Openssl libraries in order to compile squid within. Then, apply the provided patch before you built squid. The patch will add an option in https_port directive: “NO_Compression” that tell openssl to disable TLS compression (SSL_OP_NO_COMPRESSION). Why TLS compression is an issue. 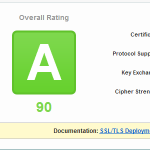 This entry was posted in howto and tagged linux, security, squid, ssl by Sébastien. Bookmark the permalink. Probably good to mention that this is not available on openssl < 0.9.9 ?? I’ve the same issue to pass the CRIME Attack. Can you re-post the patch , i don’t see the link on the post. My “download plugin” has remove all the file I shared, I don’t have the patch anymore. BTW, I strongly recommend you to upgrade your Squid to newest release.